Industrial sensors expand spectral range, go 3-D, work better in harsh environments – and get cheaper, too. Getting a better sense of a situation can make cents – and even dollars. To that end, industrial sensors are expanding their spectral coverage, adding 3-D capabilities, becoming less expensive, and enhancing their ability to work in harsh environments. For end users, the result could be a better ability to spot problems, produce products and make decisions. At diversified manufacturer Panasonic, whose industrial division is headquartered in Newark, N.J., one sensing development involves how light is routed around. Innovation in this area is paying dividends. For instance, the use of fiber optics-based sensors has cut significantly the time it takes to respond to a presence or absence of a part. Fiber optic cables (a) provide safe sensing at a distance as well as greater speed and better position information than alternatives. In use, the cables carry light from sources to detectors (b). Photo courtesy of Panasonic. “The response time is 25 µs, which also helps for repeatability,” said Charlie Strobel, sensor product manager. These sensors can come in through-beam configuration, with an example being a transmitter shooting a beam across a conveyor belt. A receiver then detects when the beam is blocked, thereby indicating a part is present. The use of fiber to deliver and collect the light narrows the beam and produces part position resolution of around 5 or 10 µm. By contrast, a self-contained photoelectric presence/absence sensor could have a resolution of as much as a millimeter, or 100 times as large, when doing the same task, according to Strobel. The use of fiber optics improves sensing in a variety of ways. For one thing, it cuts down on light loss, thereby boosting the signal. For another, because fiber restricts the angle of incoming light that makes it to the detector, sensors using the technology collect less ambient light and therefore less noise. Finally, the use of fiber can make it safe to get a signal at all. “Fiber optic [sensing] is good for hazardous conditions where you have an issue with gases or something like that. You can put the amplifier in a well-ventilated control box. Then you can run your fiber for as long as you want to go because all it is carrying is light,” Strobel said. By using different transmitter and detector schemes, versions of the technology can be used to gauge intensity, which then enables sensing of color and other part attributes. However, in some situations, fiber optic sensors are not up to industrial needs. For instance, if the distance from transmitter to receiver is measured in meters, the intensity of the light at the detector will likely be too low for robust sensing. One solution would be to go to a laser-based sensor, as a tighter and brighter beam will allow spanning a greater distance. Fiber of a different type is the basis for a new sensor from Avago Technologies of San Jose, Calif. At the beginning of this year, the company made available development kits based on a line of polymer optical fiber-based strain sensors. The fiber is laid out in a reference and measurement path, with the two legs of equal length. When under strain, the measurement path stretches and light sent down it undergoes a phase shift relative to light traveling down the strain-free reference path. In a polymer optical fiber-based strain sensor, light sent down a measurement path (c) under strain undergoes a phase shift relative to light traveling down a reference path. Such strain sensors could be used to monitor wind turbine blades (d). Photo courtesy of Avago Technologies. “This phase shift can be measured, and it correlates linearly to strain. That’s the basic principle of this integrating measurement,” said Magnus Ahlstedt, business development manager at Avago. The method offers an advantage if the monitored material is not uniform in composition, he noted; in that case, adding up strain along the length of the fiber can smooth out the associated response inhomogeneity. The fiber can stretch by some 5 to 8 percent, enabling a large dynamic range of strain measurement. The technique also allows sampling 1000 times a second or even faster, something not possible without significantly restricting the sensing capabilities of competing light-based strain-gauge technology, Ahlstedt said. Higher measurement speed could be important when looking at structural health of machinery, he added. Monitoring wind turbine blades could be a possible use of the technology because of this speedy measurement capability and its electrically isolated characteristics. Avago sees a number of applications for its polymer optical fiber-based strain sensors, and the company is working with customers to explore these. An advantage of the company’s implementation is that it is based on a common LED light source. “That allows us to significantly reduce the complexity and cost of our system,” Ahlstedt said. Sensor maker Pepperl+Fuchs is seeing strong growth, said Michael Turner, photoelectric sensing product manager for the company’s Twinsburg, Ohio-headquartered North America subsidiary. 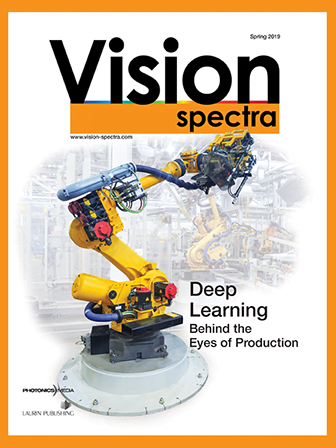 In particular, the company is seeing a lot of interest in distance sensing: Knowing where a part is in three dimensions helps manufacturing by, for instance, allowing automated machinery to do a better job of picking up parts that may be randomly oriented. In the case of Pepperl+Fuchs, the technology that enables distance measurement is based on light’s time of flight. The company’s sensors send out a pulse of light and look for the returning signal, with distance to an object determined by the elapsed round-trip time. Timing how long it takes a pulse to make a round trip to an object gives, with subnanosecond timing resolution, a distance measurement accurate to inches or less. Photo courtesy of Pepperl+Fuchs. However, light is speedy, covering nearly 30 cm (about a foot) in a nanosecond – which means a certain performance level is needed to make a useful distance measurement in an industrial setting. That last qualifier – affordability – is, of course, an important one. It’s only recently that chips and processors have gotten to the point that the technique is cost-effective. A competing approach is to send out a continuous beam, modulating it in some well-controlled way. When the returning signal arrives, its location along the modulation curve yields the time of flight – and, therefore, the distance – to the target. The disadvantage of this technique is that a light source that’s constantly on cannot be driven as hard as one that’s pulsed, and so the distance measurement range is typically less, according to Turner. Having greater reach can be important in an industrial setting, he added. What’s more, high-intensity pulses offer some immunity to noise, which on a plant floor can come from welding or other bright but intermittent sources. Pepperl+Fuchs has products that offer a line or array of sources and detectors, thereby providing distance information along a line or across a rectangular patch of space. The company uses lasers and LEDs for light sources; both are eye-safe but offer distance measurement over many meters. Because the distance to an object is known, one sensor can function in foreground or background suppression mode, as well as a retroreflector. Widespread use of distance-measurement sensors in such modes will require getting to a price point comparable to existing incumbent techniques, which means coming in below $100. Distance-ranging technology is approaching that point but is not there yet, Turner said. A final example of industrial sensing trends comes from Flir Systems of Wilsonville, Ore. In January, the company announced the release of a thermal imaging camera core, dubbed Lepton, with 80 × 60 pixels and a thermal sensitivity of better than 60 mK. This was in a camera that measures less than 8.5 mm on any side. Existing thermal modules measure nearly 20 mm (three-quarters of an inch) on a side, illustrating some of the improvement in the camera’s characteristics. That changes where the technology can be deployed. As small as a visible camera module found in smartphones, a new longwave IR camera module could allow fusing visible with thermal imaging (e) and noncontact industrial inspection (f), as seen here during food processing. Photo courtesy of FLIR. “You can have a thermal imager of sufficient sensitivity and resolution, and measurement capability that can go into anyplace a CMOS cellphone camera module is going into because it has that same size, weight, power consumption and with similar volumes roughly the same cost,” said Andrew Teich, Flir president and CEO. Besides the technology, it’s also of interest where the new core debuted: CES, the International Consumer Electronics Show. The first target is the consumer market, with a smartphone case that provides thermal-imaging capability. That alone has possible industrial sensing uses, but it also illustrates an important point: Increasingly often, consumer technology no longer lags in other areas, so new industrial sensing solutions may arise from these markets.